A new chapter on quantum nonlinear optics. Thorough treatment of parametric optical processes covering birefringence, tolerances and beam optimization to design and build high conversion efficiency devices. Treatment of numerical methods to solving sets of complex nonlinear equations. Many problems in each chapter to challenge reader comprehension. Extended treatment of four-wave mixing and solitons. Coverage of ultrafast pulse propagation including walk-off effects. Peter E. Powers was professor of Physics and Electro-Optics, and the Brother Leonard A. Mann Chair in the Sciences at the University of Dayton. He became a member of the faculty since 1997. Prior to joining there, he spent three years at Sandia National Laboratories developing mid-IR nonlinear optical sources for remote sensing and sensitive chemical detection. Dr. Powers completed his Ph.D. on femtosecond optical parametric oscillators at Cornell University in 1994 under the direction of Prof. Chung L. Tang. Dr. Powers’ research centers on nonlinear optical devices with an emphasis on optical frequency conversion. These devices have enabled applications including trace species detection, remote sensing, laser radar, and terahertz generation. He published widely in the optics literature, is a regular participant at optics conferences, and has six patents in the area of nonlinear optics. Dr. Powers was a respected member of the optics community. He chaired the SPIE Symposium: Nonlinear Frequency Generation and Conversion: Materials, Devices and Applications and was a frequent journal referee. He was also a fellow of the Optical Society of America and the SPIE, and member of the American Physical Society and Sigma Xi. Joseph W. Haus is professor of Departments of Electro-Optics and Photonics, Electrical and Computer Engineering and Physics at the University of Dayton, where he joined in 1999. He served as Director of the Electro-Optics for 13 years and he is Director of the Ladar and Optical Communications Institute. Before joining UD he was Professor of Physics at Rensselaer Polytechnic Institute for fifteen years. He also held positions in Germany at the Universität Essen and the Kernforschungsanlage and at the University of Tokyo, where he held the Hitachi Limited Quantum Materials Chair in 1991-2992. His research has covered topics in quantum and nonlinear optics in composite materials and nonlinear fiber optics and he collaborated with Peter Powers on optical parametric processes, including Terahertz generation. Dr. Haus co-founded the International Conference on Nanophotonics, which is held in China, but also has been held in Taiwan, Japan and Brazil. He has published a book called Fundamentals and Applications of Nanophotonics (2016) and he holds two patents in nonlinear optics. He is a fellow of the American Physical Society, Optical Society of America and SPIE. He is a member of the IEEE. "an excellent book, very well organized and written. It includes a good number of problems at the end of each chapter…. 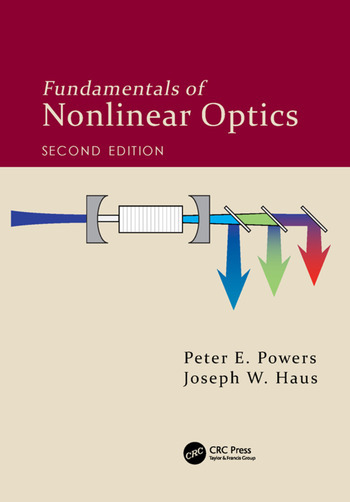 I recommend this book to anyone teaching Nonlinear Optics." "Professor Joe Haus has done a magnificent academic job of completing the second edition of this already excellent introduction…. Even in the absence of Prof Peter Powers, the main basic concepts were kept and touched up, and the revised chapters and new chapter, which brings to the nonlinear optics community and newcomers the expanding area of quantum nonlinear optics, updates the book. Great work!" —Anderson S. L. Gomes, Universidade Federal de Pernambuco (UFPE), Brazil. "This is definitely an excellent book that I will push all my students to read." "a pragmatic approach to learning the essential concepts needed for all practitioners in the field… with many realistic problems using material data and numerical algorithms to explore nonlinear phenomena. This book is destined to be very popular among students as well as with researchers in this field." "This book contains fruitful discussions covering both theoretical and practical topics. It will be a very valuable reference for scientists and engineers in the optics and photonics community." "notable for its clarity, dedication to the SI system, and the fact of covering several sub-areas without falling into the trap of becoming too specialized in any one of them. It’s one of the books that I always suggest to my students. The new quantum NLO section at the end should be a valuable addition." "The book’s principal strength, in my opinion, is the emphasis placed on developing an intuitive physical understanding underlying a range of commonly employed nonlinear optical techniques. Over 200 engaging problems reinforce this strength. The great majority of these explore pragmatic aspects associated with the operation and performance of specific devices and methods. These problems alone make the book stand out amongst its many competitors."